Kimchi is a Korean relish which some Pinoys have come to love as one of their favorite appetizer. Probably you are wondering why I posted this vegetable recipe in a meat recipe blog? 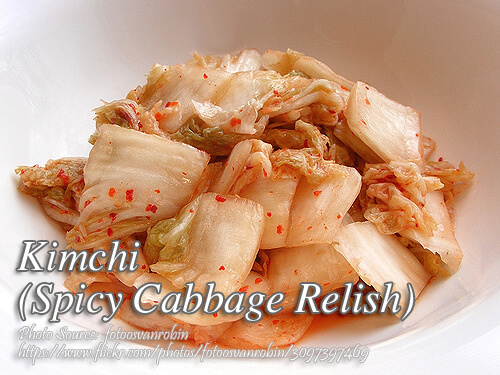 It’s because kimchi is a very good relish to fried or grilled meat dishes. To give you a little background on this dish, this spicy relish appears at practically every meal and eaten with steaming hot rice which helps Korean farmers keep warn in the long hard winter. To make kimchi; Slice the Chinese cabbage into 3/4 to 1 inch strips or squares. Combine water and 3 tablespoons of salt. Stir until salt is dissolved. Soak cabbage in the brine solution in a large glass bowl about 5 to 10 hours in the refrigerator. Drain. In a bowl combine cabbage, green onions, 2 tablespoons salt, garlic, red chili pepper and ginger. Mix well to combine. Correct seasoning if you want more salt or chili. Transfer cabbage mixture into a large sterilized jar. Cover and refrigerate 2 days or up to a week before serving. To the complete recipe with list of ingredients in exact measurements, continue reading. Slice the Chinese cabbage into ¾ to 1 inch strips or squares. Combine water and 3 tablespoons of salt. Stir until salt is dissolved. Soak cabbage in the brine solution in a large glass bowl about 5 to 10 hours in the refrigerator (You can put a weighted plate to keep the cabbage submerged in water.) Drain. In a bowl combine cabbage, green onions, 2 tablespoons salt, garlic, red chili pepper and ginger. Mix well to combine. Correct seasoning if you want more salt or chili. Transfer cabbage mixture into a large sterilized jar. Cover and refrigerate 2 days or up to a week before serving. Serve as a relish or salad. This keeps well for weeks in the refrigerator. If you want a spicier taste and more reddish color, add more chili pepper flakes. Hello, can i replace chinese cabbage with the usual cabbage in the market? Thanks! I don’t think it will taste the same as the Chinese cabbage. But you can experiment and see if that is possible. By the way, you can’t miss Chinese cabbage in the wet market, they are lots of it there and it is also called pechay baguio. You lack something that will bind the pepper flakes to the cabbage,which is a paste. A thick,soupy concoction made out of sweet rice flour (Malagkit) or regular flour will help bind all ingredients together. For this, probably 1/3 cup of water and 2/3 or 1tbs of flour cooked for 10 mins until it resembles a thick soup (slightly thicker than cream of mushroom soup) will help. This will also help with the fermenting process. For those asking where to buy red pepper flakes, Wang Mart in Don Antonio Heights has it. Hi Donna Marie, I think it depends if you want to use a binder or not. There are lots of kimchi recipes that don’t have a binder using flour.